Thank you for making our September sale our best ever, we hope you find the material in November just as interesting. In the U.S. cover section we have two nice #1s both with local cancels and there is also a 347V w/ PF cert on cover to Michigan. There are many nice lots in groups by topic, state and FDCs. There are also many larger U.S. and worldwide cover lots including a FDC of the PRC monkey #1586. 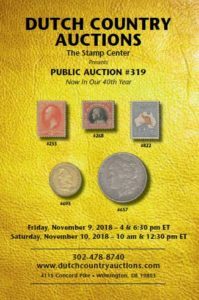 In the U.S. singles section there are many outstanding individual items like unused #76 block, 100, 115 & 121 with Yokohama cancels, 678 sheet and more. As usual we have a large number of accumulations and collections. Among the coins, this sale features: Silver Dollars (1799, 1889-CC and 1893-S), 1804 $5 Gold (PCGS certified), modern gold high-relief coins (certified), 2017 Palladium Eagle (certified). These items and more provide collectors with seldom offered opportunities to add these scarcer pieces to their collection. Our worldwide section features nice Australian Roos, Canada Jubilees, Canada #162-177 in NH blocks of 4, Cape Verde pair 5,5b unused, China PRC 948a used and unused, Falkland Islands Centenary, Great Britain 3b unused and much more. There are many excellent country collections, worldwide collections and accumulations. Hopefully you will find something of interest for you!